Sprintcar Entrants Group of WA has confirmed World Series Sprintcars Western Swing rounds will carry points towards the popular domestic AHG Series in 2018. This is a major boost for WSS in WA as the National Series will now secure support of casual nominations at the 4 rounds boosting fields and attendance for Albany, Bunbury and the Grand Final weekend at Perth Motorplex. Albany’s Kevin Theyer agrees “The bigger the WSS show, the bigger the return for the city of Albany and its business community who get right behind the event. 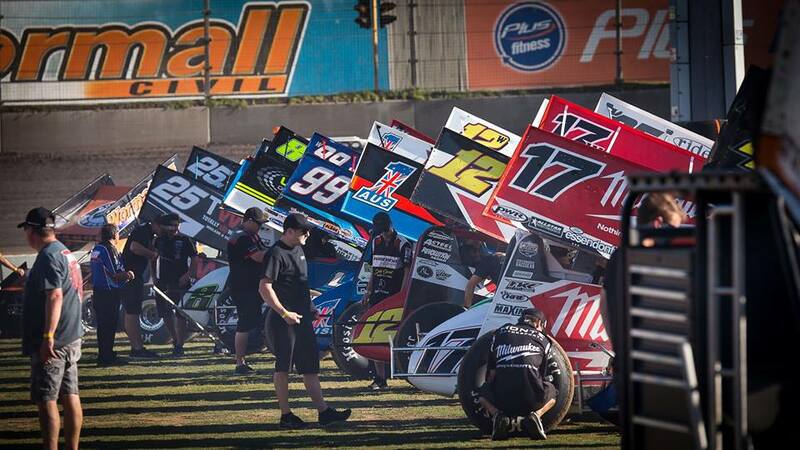 To witness a field of around 30 teams will be fantastic"
Administration of SEG are excited also for season 2017-2018 as highlights will include the John Day Classic/WA Sprintcar Championship, the four-night USA v WA Sprintcar Speedweek that will be held at the Motorplex and Quit Bunbury Speedway venues and WA rounds of World Series Sprintcars that will be incorporated into the AHG Series. The Western Swing commences at Albany on February 16, then moves to Quit Bunbury Speedway for Saturday February 17 with a spectacular Grand Final weekend planned for Saturday & Sunday February 24 and 25 at the Perth Motorplex. Photo: Richard Hathaway captures the thrill of a full Sprintcar field expected for the Western Swing of WSS31 in 2018.